Burelom [Storm Debris], no. 2, December 4, 1905. Weekly literary satirical magazine, edited and published by G. P. Erastov. St. Petersburg. Typography: Тоvarishchestvo [Company] "Narodnaia Pol'za" [National Advantage.] Journal of political satire. This issue contains poetry, prose, pictures and illustrations. 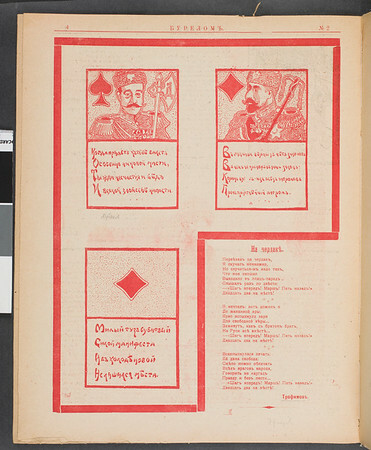 This issue was confiscated by order of the censors. Two different no.1's and no.2's came out in 1905 and a no.3 in 1906. The other "no.2" came out on Dec. 25, 1905, as the "Christmas issue." "Burelom" was continued by "Buria," which kept the numeration.